Bikini Battle Basics is a series of articles here on TheMetalBikini.com where we dissect certain game mechanics to aid in understanding and promote effective application. In short, it's stuff you need to know, but is somewhat obtuse or hard to understand or could just be a topic that warrants further discussion, but doesn't fit directly into a category like Listbuilding, for example. So this is one of those things people are either going to think is totally useless or really handy. Me? Well, obviously I think it's really handy. I've been messing around with my Regionals lists again and for whatever reason, I've found myself wanting a list of all the Elite Pilot Skills arranged by whether or not they require an Action. Predictably, I've gone and made one since I couldn't find one lying around anywhere. After I did that, I added in other stuff that also counts as Actions- a couple of droid abilities and the three basic Actions along with Boost and Barrel Roll. 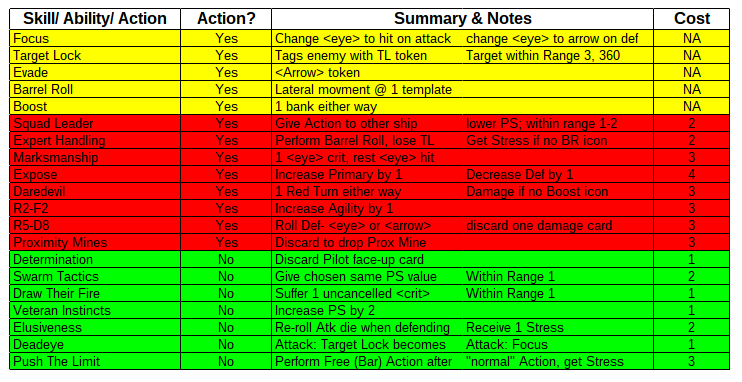 Yellow are the "icon" actions that are available inherently to ships in X-Wing Miniatures. Red are Actions that actually require you to spend your Perform Action on them. Green are Action type effects that don't require you to actually spend an Action to activate them. I can't really say why I didn't include the named pilot abilities or why adding in the rest of the Astromechs doesn't jive with what I "need" out of this list. If enough of y'all want me to, I will add them though. Please note that the summaries and notes are just that- not the full card text. Read the appropriate entry in the Listbuilding Resources section for the full monty. Sorry if this seems like kind of a short update- I went and played Arkham Horror with the owner of one of my FLGS tonight and it ran rather late. Also, there's going to be another article that will inevitably going up later today anyway.